The New York City Department of Education has dedicated the city’s first net zero energy school. The Kathleen Grimm School for Leadership and Sustainability at Sandy Ground, designed by Skidmore, Owings & Merrill LLP (SOM) achieves its net zero energy target by harvesting as much energy from renewable on-site resources as it uses on an annual basis. 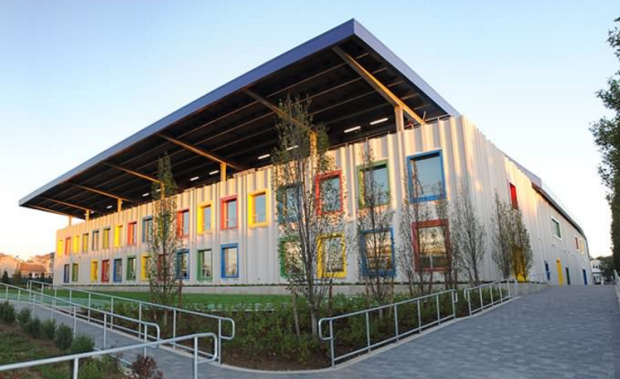 Located on the south shore of Staten Island, the 444-seat, 68,000-square-foot primary school is designed to comply with the SCA Green Schools Guide, a stringent rating system developed specifically for New York City public schools. As the SCA’s first “sustainability lab,” the Kathleen Grimm School will also help achieve the OneNYC goals for reduction in global warming emissions. “By pushing for higher environmental performance with our design, we have a remarkable opportunity to define a new standard for energy efficient school buildings in New York City and worldwide,” said SOM Design Partner Roger Duffy. Situated on 3.5 acres, the school is oriented to the center of the “L” shaped site in order to optimize natural light for the interiors and the photovoltaic panels. The gym, cafeteria, library, and administrative offices are adjacent to the main entrance, while all learning spaces are on the north and south sides of the building along a double-height offset corridor. The sizable corridors promote visibility and facilitate easy circulation throughout the building, as well as bring ample sunlight to both floors of the building.